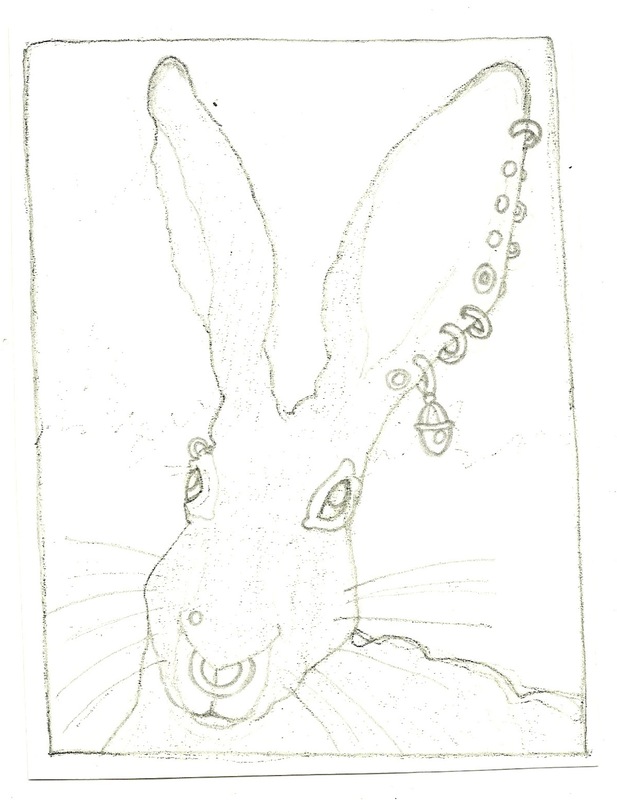 It's been AGES since I did any carving and despite having Taxes and loads of other more important things to attend to I decided to get to work on my already late "Year of the Rabbit" cards. 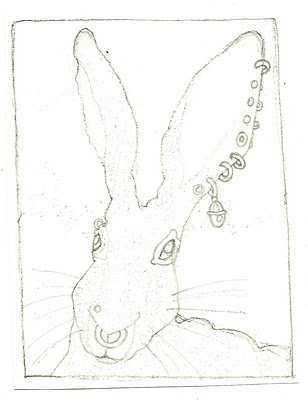 My image was drawn from a nice photo of a jackrabbit on the web stylized a bit to allow for some easier carving and loosely drawn in a format that will suit a small postcard-sized image. "Why don't you add an earring?" and the idea was planted and it was a good one. This is the year of the METAL rabbit and multiple piercings are all the rage here in Santa Cruz, (Northern California) and elsewhere so this will be just perfect. This image became the hanshita and I've just finished carving and proofing the keyblock. Next the proofs will get glued down to new boards to allow for the color blocks; I'm thinking probably four color blocks in addition to the keyblock. went up today and will be on display until April 15th. 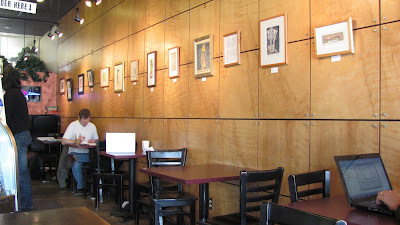 We hung 19 prints this afternoon at Coffeetopia, 1723 Mission St; Santa Cruz: a local, popular coffeehouse. No photos yet, I left my camera at home and was whizzing about trying to get them all up after the shop closed. Dave the owner graciously helped hang the prints and adjusted the lighting. All that's left to do is sneak in in the morning and put up all the identification tags of the framed prints. There will be a mid-show opening March 25th 6-8p and I hope anyone in the Santa Cruz, South Bay or San Francisco area can come!